This romantic fantasy was especially created for that special someone: the 21 fiery red roses will fill her heart with passionate love. 2. Send Gifts To Romania quality guarantee: Send Gifts To Romania offers flower delivery to Romania at the highest standards: all flowers are fresh, picked manually and wrapped elegantly. 3. 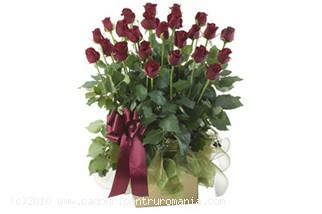 About flower delivery to Romania: Send Gifts To Romania offers flower delivery to Romania Monday through Saturday. For all Sunday flower deliveries to Romania, please contact us in advance. 4. About scheduling a flower delivery: You can schedule a flower delivery to Romania Monday through Friday – Starting 2010, Send Gifts To Romania also offers Saturday flower deliveries. Please contact us in advance if you would like to schedule a Sunday flower delivery. 5. Send Gifts To Romania gift and flower wrapping: all gifts are beautifully wrapped and accompanied by gorgeous luxurious ribbons or other gift accessories; each and every flower bouquet is individually checked for imperfections so that each flower delivery makes a breathtaking surprise.